Layers of cake, frosting, and fresh cranberry sauce make this a fantastic holiday dessert. But keep a package of fresh cranberries in the freezer so you can make this treat any time of the year. 1 of 6 Heat oven to 350 degrees F. Grease and flour three 9-inch-round cake pans. 2 of 6 In a medium-size bowl, stir together flour and baking powder. 3 of 6 In large bowl, beat butter until smooth. Gradually beat in sugar until fluffy and light colored, 3 minutes. Beat in eggs, one at a time. 4 of 6 In a measuring cup, whisk together milk, lemon juice and vanilla. 5 of 6 On low speed, alternately beat flour mixture and milk mixture into butter mixture, ending with flour. Stir in lemon rind. Divide batter evenly among prepared pans. 6 of 6 Bake in 350 degree F oven until tops spring back when lightly pressed, 25 minutes. 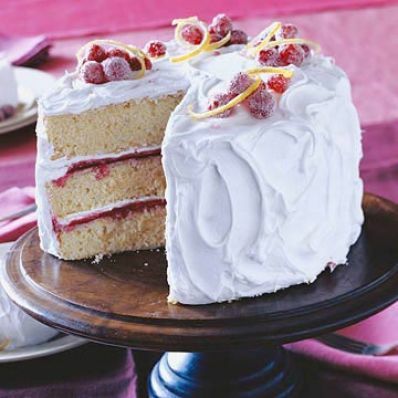 Let cake layers cool in pans on rack 10 minutes. Invert cakes onto rack; remove pans. Let cool. 1 of 1 In saucepan, combine cranberries, sugar and lemon juice. Bring to simmering over medium-high heat; cook, stirring, until berries pop and mixture thickens slightly, 5 minutes. Scrape into sieve over bowl; press through sieve, discarding seeds and solids. You should have 1 cup filling. Let cool to room temperature. 1 of 2 In heavy-bottomed saucepan, combine egg whites, sugar, salt, water and corn syrup. Beat on medium-high speed with a hand mixer over medium-low heat until icing is thick, pure white and fluffy (soft, shiny peaks), about 7 to 9 minutes. Remove pan from heat. Add extracts; beat until very thick, 1 minute. 2 of 2 Place one cake layer on serving plate. Top with half the filling, leaving 1/2-inch border around edge. Top with 3/4 cup icing. Repeat with second cake layer, remaining filling and 3/4 cup icing. Top with remaining cake layer. Spread remaining icing over sides and top of cake. Garnish with sugared cranberries and lemon slices just before serving, if desired. Makes 16 servings.